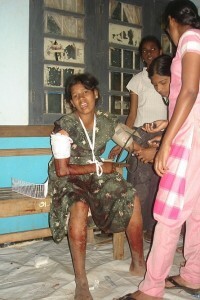 Human Rights Watch has posted a photo montage of the humanitarian catastrophe in the northern Vanni region of Sri Lanka. Human Rights Watch researcher Anna Neistat says both sides in Sri Lanka’s conflict are violating the laws of war, endangering the roughly 100,000 civilians trapped in a government-declared “no-fire zone.” Tamil Tiger (LTTE) rebels have prevented civilians from leaving the tiny strip of land, while government forces shell the area daily, leading to numerous casualties. The photos in this slideshow are from a makeshift hospital in Putumattalan that was treating survivors of attacks on April 8 and 9, 2009. Many were women and children who were waiting in a food distribution line in Pokkanai when artillery shells hit.